When I first started using my Serger, I was loathe to change the threads to different colours. If you've ever had to rethread an overlocker, you know what a super huge pain it can be. Tiny little holes way deep in the machine and there's usually three or four threads to do. Mine needs some long handled tweezers, a sharp pair of scissors and heaps of patience. Somewhere along the way, my mum tipped me off that there's an easier method. Thanks Mum! 1. With plenty of slack, using an overhand knot, tie the new threads to the old. 2. Make a note of your current tension settings then reduce them all to zero. 3. 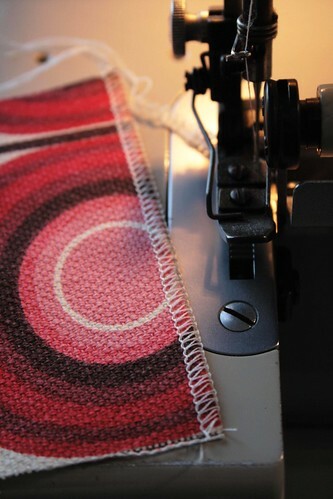 With the presser foot up, slowly pull all the threads through the machine. You can also put the foot down and use the pedal to run them all through, but you have to go slow and make sure the knots don't get caught anywhere. 4. Stop before the knot makes it to the needle eye. You're going to have to rethread that one by hand. Most times the knot won't go through and you'll either mess up the rest of the threading or bust the needle. Whoops! 5. Reset your tension and you're finished. Quick as a wink and no tweezers required. Rethreading the serger is definitely a PITA. I do it this way, too. I hate having to rethread my serger. This is the best way to do it. My mom told me right before I threw mine out the window lol. I sure hope this comes in handy for me in the future. I'd definitely be scared to rethread such a complicated machine! That's how I've rethreaded my serger(s) for years... even now that I have the super easy to thread babylock imagine, it's still simpler to just tie on new threads. Great idea - can't wait to try it. 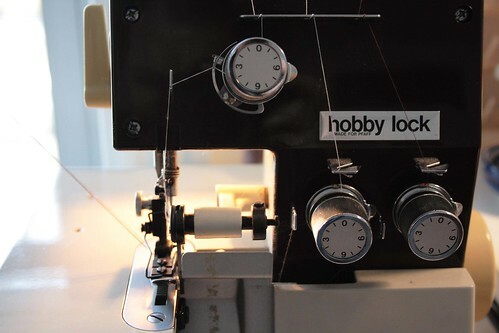 Hi, with my serger (we call them overlock machine over here in germany) this procedure doesn´t work with the 2 "needle threads" but the others work great! 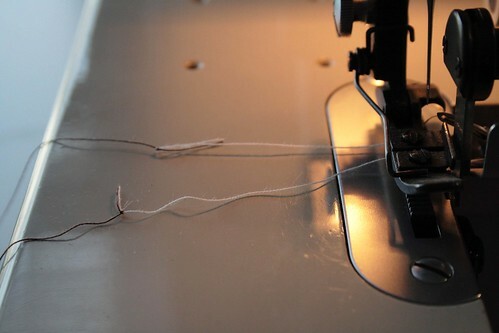 My mom taught me a similar method for re-threading sergers (as we call them in Boston, MA USA). However, the knot method was slightly different. 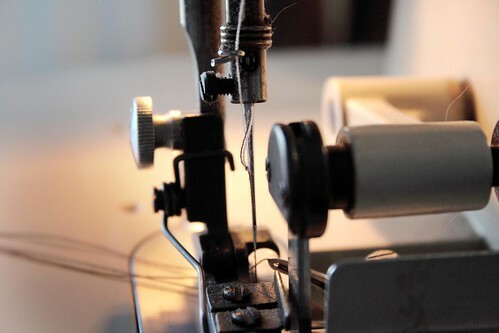 You start the same by cutting the old thread and putting the new spools on. However, using the old thread you then tie a simple knot around the new thread, and do the same with the new thread around the old. You then pull the two together and snip the tails. This makes a smaller knot that may even fit through the needle holes. 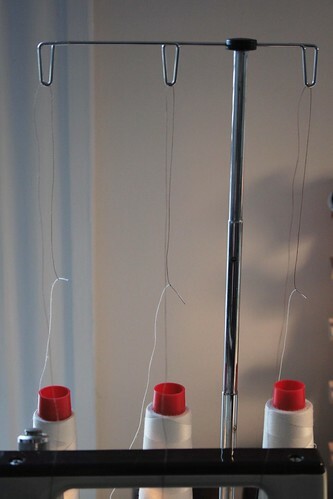 No need to adjust tension - simply pull thread away from tension rings (you know - slip it from between the discs), pull gently till new threads are thru, then slip new thread back between the discs. I learned this in getting to know your machine class WAAAAY back in 1984 - still using the same machine. This post was fantastically helpful! Thank you! I tried that tip on my Bernette Funlock - what a great tip - Thanks a lot!